A new Pensacola landmark, the idea and execution is great! 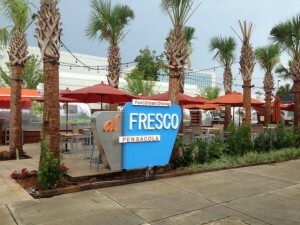 Al Fresco is located downtown Pensacola in an area that has recently undergone a transformation. What was old empty buildings, just going to waste. Is now a vibrant and bustling area. One of my favorite additions was Al Fresco. The traditional restaurant is Jerry’s Cajun which has been a town favorite at its previous location, but just moved downtown for this venture. Always good food there. I personally seem to always go to Gouda Stuff as I love gourmet grilled cheeses, and there are several good ones to choose from. Sharon loves the fish tacos at Z-Taco. Neither of us have been to the other 2, yet. As they just recently opened.